Inspired by the first UK Future of News meet-ups in London, a couple of regional nests have been formed, with the Brighton and West Midlands groups holding their inaugural meetings last night. My colleague Laura Oliver live-blogged some notes from our Brighton event, which featured the Argus online editor, Jo Wadsworth and the Guardian’s software architect, Simon Willison. Willison, who was the lead developer for the Guardian’s crowd-sourced MPs’ expenses projects, talked about the ups and downs of user-driven information gathering; and about his latest collaborative launch, Wildlifenearyou.com, a project that collects users’ animal photographs for an online wildlife mapping project. Users can rank and identify photographs, building their site profiles. The feature allowing users to pick their favourite picture of two (for example, what’s your favourite meerkat? ), accumulated more than 5,000 votes within a few hours. As Laura notes, a specific version of Wildlifenearyou.com, Owlsnearyou.com launched just a few weeks ago. Getting the site some extra coverage, Owlsnearyou cannily “piggybacked” on the Superbowl hashtag on Twitter by creating “Superb Owl Day”… Geddit? Willison also told the group about OpenStreetMap, the first free, wiki-style, editable map of the whole world. He said that the project has become adept at responding to crises. OpenStreetMap was given some high resolution photographs of Haiti, when the earthquake occurred, and the team traced them to create the best digital map of Haiti available. It has become the default map for rescue teams, Willison added. This entry was posted in Editors' pick, Events, Online Journalism and tagged Collaborative mapping, haiti, Jo Wadsworth, OpenStreetMap, Owlsnearyou.com, simon willison, Technology/Internet, The Guardian, wildlifenearyou.com on February 9, 2010 by Judith Townend. It’s nearly an entry for the Radio 4 ‘Sorry I Haven’t A Clue’ Late Arrivals game, and definitely a candidate for PopBitch’s ‘Favourite’ feature: PCSO Sam Justice is among the new police community support officer bloggers recruited by the Brighton Argus. As reported very speedily by Sarah Hartley this morning, Newsquest’s Brighton Argus plans to use community police officers to cover local beats for its hyperlocal network. “I’m hoping the contributions to the site will start becoming really varied, a mixture of people hoping to cut their journalistic teeth, the community figures who have always reported on their neighbourhoods in some shape or form, and those who want somewhere to get their voices and stories heard,” web editor Jo Wadsworth told Journalism.co.uk. 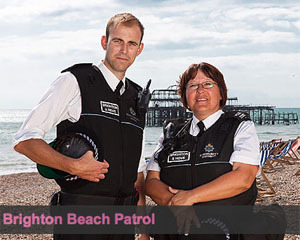 And if she’s looking for more contributors, Journalism.co.uk would highly recommend checking out Channel 5’s Brighton Beach Patrol, featuring some wonderful characters we’ve been looking out for ever since [show pictured left]. Wadsworth has been building up the community correspondent network for a while: around six months ago, students from Brighton Journalist Works were brought on board. Students upload weekly vox pop video interviews with members of the public and three students run a weekly fashion blog. Earlier in the year she recruited – with a little egging-on from Journalism.co.uk – Guardian media blogger Roy Greenslade as a Kemp Town community correspondent, whose latest post can be viewed here. This entry was posted in Citizen journalism, Newspapers, Online Journalism, Social media and blogging and tagged brighton beach patrol, Jo Wadsworth, journalist works, pcso, police community support officers, Roy Greenslade on November 5, 2009 by Judith Townend. Jo Wadsworth: Where is advertising moving online? (One of Jon Bernstein’s 15 news men and women to follow on Twitter) Jo Wadsworth rounds up a busy week in advertising, starting with last week’s news that online advertising has become the biggest advertising medium, according to an Internet Advertising Bureau (IAB) report. But rising forms of advertising (paid search and social media for example) aren’t what news sites might currently benefit from, she adds. “Of course advertisers have always found ways to avoid shelling out for adverts (…) But the difference here is that social media allows brands to bypass mass media entirely. And it’s not just commercial brands – it’s also local authorities, celebrities, politicians, lots of the people who previously relied on the papers to get their message out there,” she writes. This entry was posted in Advertising, Editors' pick and tagged Jo Wadsworth on October 13, 2009 by Laura Oliver.